When motorway services were introduced to the UK, firms would often create new names to go with them. 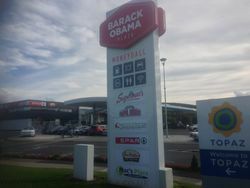 Ireland's motorway services only started to take shape in 2010, and with the benefit of hindsight, they often decided to use existing names and push them as far as possible. In this section we look at those names in a little more detail. Pages in category "Brands at Irish Motorway Services"